LAST year, Taiwanese companies operating in Malaysia were complaining about the shortage of labour and the weakening of the ringgit, warning that they may be forced to relocate out of the country. But the mood seems to have changed. According to Representative James Chang Chi-ping of the Taipei Economic and Cultural Office in Malaysia, 1,700 Taiwanese companies are doing business in Malaysia and he expects more to come in the future. Kuala Lumpur is the preferred destination, followed by Penang and Johor. “As an observer, it looks to me that they are still quite happy with the current business environment in Malaysia. Foreign labour was an issue last year, but it has been sorted out,” he tells The Edge. Chang highlights that Taiwanese companies have been around for the last two to three decades and many have established a strong foothold in the country. “In general, they are doing pretty well. I think the longer they are here, the more successful they have become,” says Taiwan’s de facto mission head in Malaysia. It is interesting to note that Chang’s remarks contrast sharply with comments made by Hsu Cheng Te, the then-president of the Taipei Investors’ Association in Malaysia (TiAM), last year. In October, Hsu had told the media that in the last two years, many Taiwanese manufacturers had been afraid to accept new orders for fear of not being able to fulfil them because of the labour shortage. He also cited the weakening ringgit. “The ringgit has declined close to 30% (against the US dollar). Since most raw materials are imported and are paid for in dollars, many [companies] are making losses,” he is reported to have said. Hsu had said that Taiwanese investments overseas are currently concentrated in Vietnam, Cambodia and other Southeast Asian countries, which had opened up their economies not so long ago. 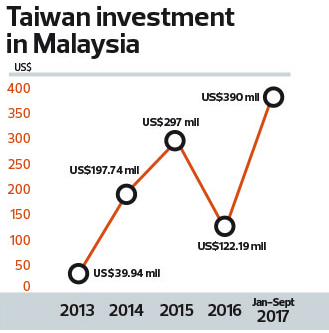 Chang, however, stresses that Taiwan remains Malaysia’s fourth largest foreign investor and eighth largest trading partner. Bilateral trade between the two countries amounted to US$17.5 billion last year, which was an increase of 24% year on year, up from US$14.1 billion in 2016.